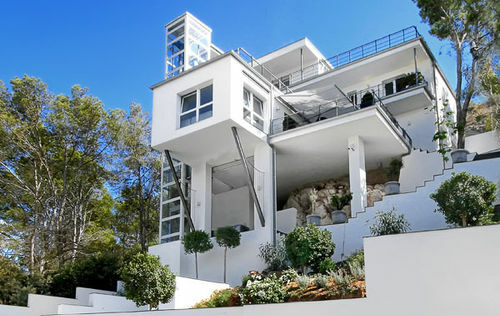 By its special architecture this architectural masterpiece adapts perfectly at the hillside of the popular, exclusive area of Port Andratx. Beside the living area of approx. 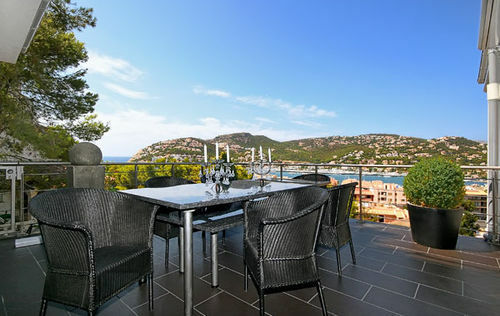 300m2 this object provides fabulous terraces of approx. 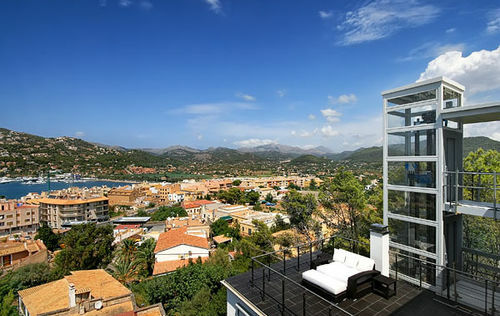 200m2 – all of them with a unique view over the open sea and the harbor and locality of Port Andratx. Set on a plot of approx. 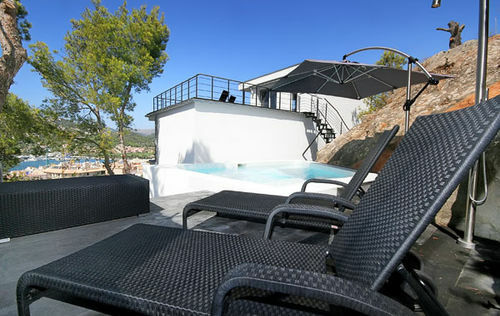 1000m2 and built on three columns, the villa is arranged by well-known designers and forms a distinctive attention getter. The unique puristic pool completes the object as another highlight. 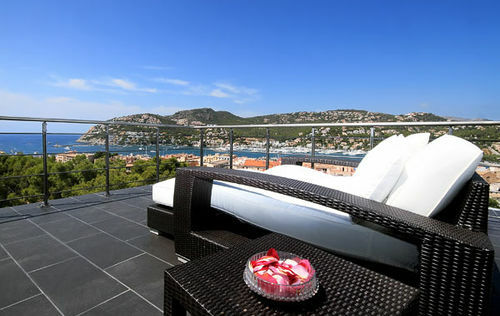 By a glass lift or by the stairs one can reach all four areas of this exclusive villa. On the lowest level there is a lounge with an open fireplace. 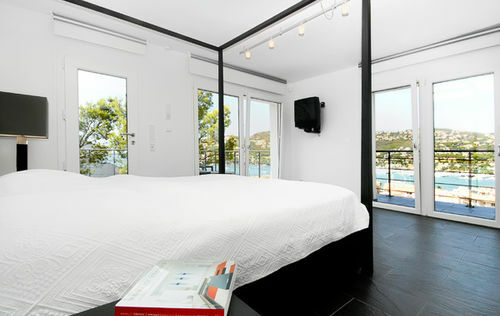 The representative entrance is on the first floor as well as a bedroom with bath en suite which can be used for guests. 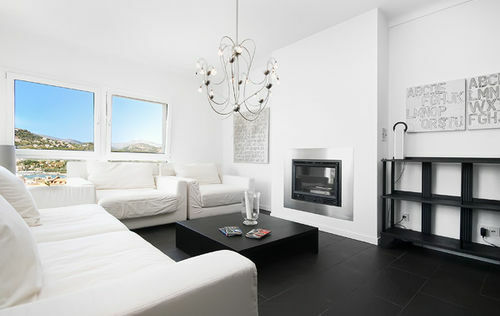 Furthermore there is the living and dining room with a half-open design kitchen which has also an open fireplace. There are two more classy and spacious bedrooms on the third level. Die Penthouse which is still one floor up has got another bedroom with a bathroom en suite. 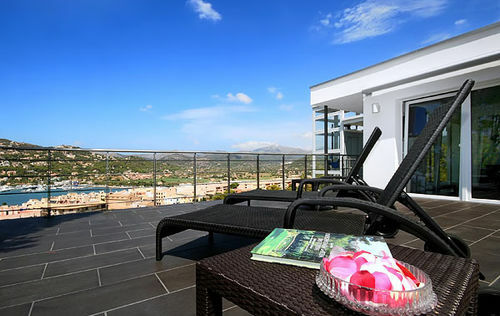 The features and fittings of the villa include high class design furniture, reversible air condition, central and under floor heating, blinds and sun protection inside, swimming pool, alarm system, video-intercom of the plot, garden irrigation system as well as parking for three cars.